Are you ready to retire those old torn-up towels or hand-me-down dog beds and bring in some easy-to-clean new digs? Or are you looking for a practical but pleasing gift for the dog owner who has everything? Read on for more information on our high-quality, washable, durable, and beautiful crate pads and dog beds - or order one now! 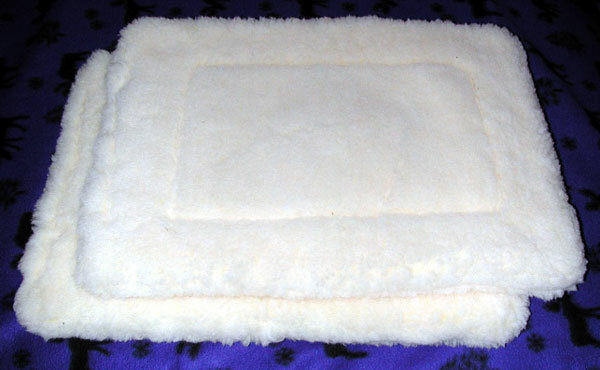 Our high quality Double Happiness Crate Pads are super soft, durable, and long-wearing. They consist of two layers of thick polyester lambskin sewn back to back. 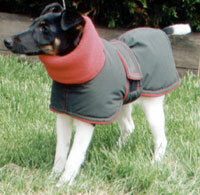 All crate pads are machine washable on delicate; dry on line or in machine dryer on low or gentle. Our beautiful, long-wearing Double Happiness Stuffed Beds are reversible beds stuffed with 100% polyester stuffing with a fake short fur material on one side and a lambskin fleece on the other. Beds are about 4” thick and provide a comfortable, supportive mat for crates or for use on the floor or in the car. Stuffed beds can be machine washed and dried on low or delicate. Standard sizes fit Varikennel type airline crates, but not the standard wire crates many people use. Check your crate sizes. 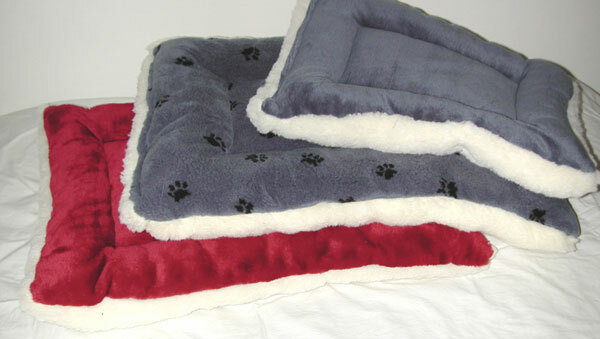 Stuffed beds are available in Red, Burgundy, Dark Green, Dark Blue, Light blue with paw prints, and Medium Brown with paw prints. Second side for all is lambskin fleece. and the quality is absolutely first rate." "I'm ALMOST anxious for cold weather...!" Coats are custom made to your measurements.